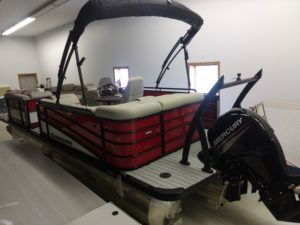 This is a 2018 Berkshire, 23′ Berkshire Tri-toon with Mercury 150HP Four Stroke Motor. This Tri-Toon has Blaze Red/White exterior, Depth and Fish Finder! Upgrades include 3.0 performance package, Teak Vinyl Floor, Black Out Package, Sport tow bar and a Bolster Seat!